Agencies that partner with the East Aldine District attended a luncheon last Thursday at the District offices, and brought the group up to date on their current activities and programs. Also speaking at the luncheon was State Senator Mario Gallegos, on issues that were brought before this session of the state legislature, and also the several redistricting maps that are currently being appealed in the courts. The Senator spoke about the deep cuts in the budget, to education and health care. Education was cut by $4 billion from the previous 2 years, with an additional $1.4 in discretionary progams, and health care was cut $3 billion, including nursing homes and children’s health programs. He voted against the new budget, because he felt the state should have used the reserve or “rainy day fund” instead of allowing cuts to services. Jeanette De Los Santos spoke about the help that her 2-1-1 service offers the public, and the fact that it operates 24 hours a day, 7 days a week, in all languages. 2-1-1 HELPLINE can offer emergency transportation, and advice on many social service programs and community resources. She said a current issue they are helping with is to stop electric companies from disconnecting service to customers not paying their bills. Gretchen Larson and Virginia Bazan reviewed plans for the District’s 10th Anniversary celebration, which will be several events during the month of October. A special anniversary party for the public is planned on Oct. 22 in James Driver Park. Virginia and Shirley Reed reminded the group of the annual Fall Fest on Oct. 29th at the Sheriff’s storefront location. 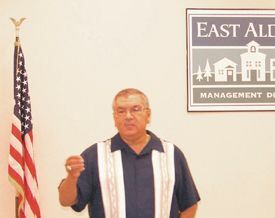 Richard Cantu gave a report on East Aldine’s activities and projects. The Special Sales Tax election has been set for Nov. 8th, and if passed will allow the District to collect the 1 cent tax in a small area to the east of US59 that until now has been overlooked by all governing bodies. The voters must approve this, although most of the monies collected will be from customers outside the District, Cantu explained. Also scheduled is the installation of 25 additional street lights, in areas identified by a survey of need. The new Public Health Committee will set up a “Hope Project” soon, to help elderly and needy with minor home repairs. The Public Safety Committee is planning to install mobile surveillance cameras in high crime areas, to enable the sheriff’s deputies to monitor possible criminal activity. The District is sponsoring a Senior Dance at the Northeast Community Center, along with State Representative Armando Walle. Cantu also reported that the Water & Sewer work in Zone 11 east of US59 is underway. This is the largest project to date for the District, and will bring service to about 1000 homes. NORTHEAST— During the current Congressional recess, Congressman Gene Green has hosted a series of Town Hall Meetings where he discussed updates on legislature issues concerning the community and listened to citizens’ comments. 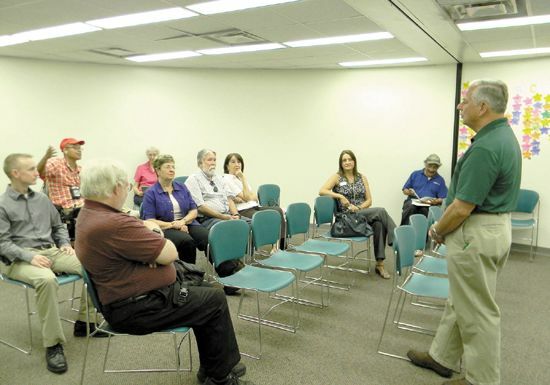 The latest Town Hall meeting was last Saturday morning, at the Aldine Harris County branch library. A small but interested audience listened to Green’s legislative update, and then asked questions that in many cases related to their own situation. Also attending was State Representative Armando Walle, to answer state related questions. One of the main issues discussed was the one affecting seniors and disabled. At this Town Hall Meeting, representatives from the Social Security Administration, Houston/Harris County Area Agency in Aging, and the center of Medicare and Medicaid Services were available to share and answer important information about health care, referral services and programs for seniors. Another issue that a community leader brought to Gene Green’s attention was the production of unnecessary coins such as the $1 dollar coin. This person mentioned that with the economic recession, the Government should not be spending money on producing these coins that are worthless and not used by the public. Other people were asking for some information regarding leasing apartments for the elderly and disabled. Congressman Green has team members who can assist people on these types of issues, and follow up their cases and situation; however, Green emphasized that not only during Town Hall Meetings can you talk with him, but “Our office is open for any questions or concerns you have regarding the federal government, and you do not need to wait for a district event to contact me. Another way to stay up to date with us is through our electronic newsletter, which is sent periodically and gives up to the minute information on legislative initiatives and district events.” To sign up for a newsletter, visit ct-me/newsletter” http://greeen.house.gov/contact-me/newsletter. Green mentioned that not only has he conducted Town Hall Meetings and Senior Citizen Forums this last month, but he is also sponsoring a Paying for College Workshop and Academy Day for parents of college bound students on Monday, September 19th at the Aldine Senior High School, starting at 6:30 pm, and a Job Fair on Friday, September 30th starting at 9:00 am at the Campbell Center on Aldine Bender Road. 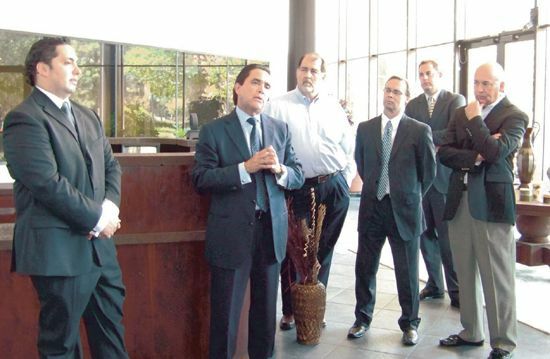 A Mexican company has opened a new office in the Greenspoint District, in conjunction with the Houston Intercontinental Chamber. Contact Line LLC is a Mexican company that recently opened its new branch in north Houston, within this call center, a Hispanic Business Center (HBC) with executive suites is been installed. The function of the HBC is to bring Mexican companies and help them get their company branch installed in Houston; and at the same time create employment in this area. The goal is to have “500 employees by the end of next year,” said Alejandro Del Valle, president and CEO of Contact Line LLC and the Hispanic Business Center. The Hispanic Business Center is located at 12700 Northborough Dr., with room for 300 executive offices in a 6-floor building. “We have 60 offices ready to use and 15 contracts signed already with Mexican companies, we are analyzing 40 more possible business,” said Del Valle. Alejandro Del Valle moved to Houston almost two and half years ago and began to constitute a new branch for his Mexican Company, Contact Line S.A. de C.V. Now, that he has installed a branch of his company in Houston, Del Valle and the Hispanic Business Center formulated a kit called ‘Como?’ which means ‘How?’; the kit provides legal advice, guides Mexican businessmen through the process of getting their branch company settle in Houston. The selling of the products is through the call center, Contact Line LLC, which has a database of 210 million consumers and 17 million companies and where bilingual personnel call to offers products and/or services offered by those Mexican companies. “What are we selling is a product of Mexican companies,” said Del Valle. Some of the companies Mr. Del Valle mentioned to been installed in the Hispanic Business Center are a powdered milk company, an agricultural business, and a tequila company. The Hispanic Business center besides creating employment in the Greenspoint District, also helps the economy. “I’m very happy to be part of creating employment. And I want to thank Jack Drake, President of Greenspoint District, the Houston Intercontinental Chamber of Commerce and Ms. Parker who have supported and helped us all the time,” said Del Valle. 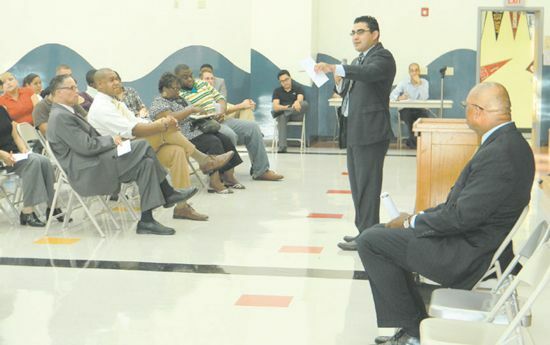 NORTHEAST HOUSTON– On August 18 and 19, 2011, State Representative Armando Walle hosted the annual Town Hall Meetings where he mentioned the most relevant topics discussed at the Legislature. At the Town Hall Meeting on August 18, the main topics for Northeast area were education, health care and public safety. Armando Walle mentioned that education is very important, “it’s personal,” he added. The special guest for this session was Houston Police Chief Charles McClelland. He said they have had financial challenges, and it has been the most difficult ones they have faced in the city and as a department. But “with almost 7,000 employees our goal every single day is to keep and track 2.5 million people safe in an area of 660 square miles,” said McClelland. He mentioned that the Northeast area has done extraordinary well when it comes to crime. Rep. Walle said public safety affects everybody, even undocumented people. And when there is a robbery, sometimes people do not report the crime. “Why? because he is undocumented,” Walle said. Armando Walle also mentioned that “At this legislature session 5,000 bills were filed and only 1,000 make it.” Despite how difficult it is to pass a bill, Armando Walle would like to continue to hear from the community on priorities. “If there is a bill and I believe is going to hurt my community, I’m not gonna vote for it. 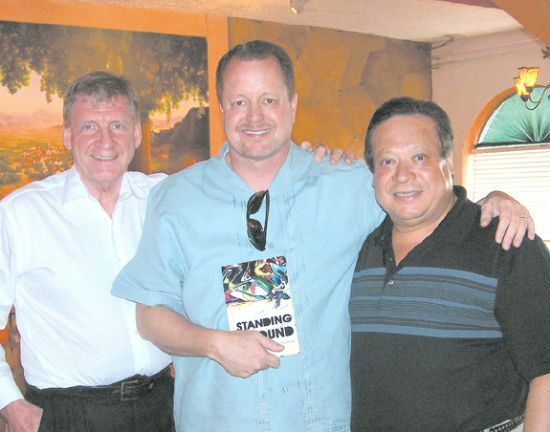 If I’m not doing the right thing, you need to tell me,” Walle said. A large audience of interested citizens gathered last Friday night, to hear State Representative Armando Walle report on his second term in the state legislature, and to voice their opinions on quality of life in the Aldine area and District 140. In addition to Walle, presentations were made by Congressman Gene Green, and Harris County Sheriff Adrian Garcia. Walle reviewed the changes in precinct boundaries, which result in much of his district moving into Commissioner Morman’s Pct. 2 and out of Commissioner Lee’s Pct. 1. Walle is working with the leaders to determine what changes this will cause to county services. He said “I’m hopeful, but it remains to be seen.” He explained that the redistricting was required after the 2010 census, to equalize population in the four county precincts. Walle started by reviewing the budget cuts in the 82nd Legislature. With a potential shortfall of $27 billion in the two year budget, many programs had to be cut because the expenditures have to match the revenue that the Texas Comptroller certifies. Walle said the Business Margin Tax passes in the 80th session did not raise the projected revenue to make up for property tax reductions since then. Last year federal stimulus money was used to alleviate the shortfall, but in this session no such funds existed. Therefore, the legislature ending up cutting the education allotment by $4 billion, and an additional $1.58 in discretionary funds in education. In Public Health, another $4 billion was cut, which will result in Medicaid reimbursements that are lower, affecting children and elderly, who make up most of the recipients. Walle helped pass a number of bills dealing with discipline of unruly students in the schools, taking a more progressive attitude toward their treatment. Two bills of local interest were the noise ordinance, and the private water utilities and their rates. He reported that his noise ordinance bill was blocked by the speaker of the House after getting approval of the delegates, and he was able to amend a bill to get some notice and explaination when a utility was planning a rate increase. Congressman Green reminded the audience of his annual Immunization Day on Saturday, in three locations including Stephens Elementary in Aldine. He also called attention to a Paying for College Workshop on Sept. 19 at Aldine Senior High School, and a Job Fair on Sept. 30 at Campbell Center. Sheriff Garcia noted that his department is suffering from losing 125 patrol deputies, and a hiring freeze in the county that will not allow him to replace them. Although statistics show crime rates are down in the city and county, he urged citizens to report every crime, which he feels will force the commissioners to allocate more resources. These reports can be made anonymously, and now on-line by the internet and soon by smart phones. He outlined the programs he conducts with the help of East Aldine District, and thanked them for that partnership. In other comments, residents voiced concern over trash collections, and crime rates. 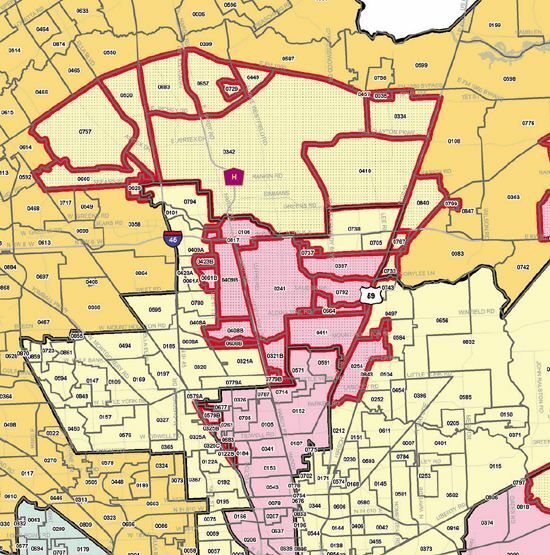 NORTHEAST– Residents and voters of the Aldine area, who are used to receiving services and dealing with Harris County Precinct One, will find themselves in a new precinct after January 1st, 2012 if the new redistricting map survives a court challenge. Last Tuesday, Aug. 9 the County Commissioners held their fifth public hearing, and then proceeded to adopt what is known as Revised Map A-1. A few changes were made from the original A-1, to respond to criticisms that the Hispanic vote had been diluted and that Pct. 2 was no longer a “Hispanic Opportunity” district. The changes included returning two precincts in the Huffman area to Eversole’s Pct. 4, and taking five additional precincts in the Aldine area that were Lee’s Pct. 1, and reassigning them to Morman’s Pct. 2. Also, another five would be split between the two precincts. This has the effect of making almost all of East Aldine District now in Precinct 2, where it had been in Precinct 1. Attorney Gene Locke, whose law firm helped draft the plan, said that he feels the final plan meets the criteria of the Voting Rights Act, and the goals of the commissioners. Although the Hispanic population in Pct. 2 is now about 60%, and it will be 58.2 in the new plan, nevertheless the new map shows more Hispanic population in Pct. 2 than previously existed. However, the lawsuit filed by city councilmen James Rodriguez and Ed Gonzalez and five others, says that this dilution is not acceptable, and amounts to a “retrogression” not allowed by the Voting Rights Act. In the public hearings held earlier, State Senator Mario Gallegos and State Representative Armando Walle, both of whom represent the Aldine area, complained about the diultion of Hispanic votes, and the gerrymandering that split their districts. One of the criteria for the remapping had been a “compact” outline, which is not apparent in this map. The current map returns Precinct 1 to an African-American plurality voting district, and therefore has the support of Commissioner Lee. Hispanic population growth had made existing Pct. 1 an Hispanic plurality. Hispanics have presented the court with an alternative map, known as the Jara plan, drawn by Robert Jara and activitist Rey Guerra. It redraws the boundaries in a gerrymandered approach, that results in a Pct. 2 with 73 percent Hispanics. Commissioner Morman, although not Hispanic, pointed out at the Commissioner’s meeting that he is well prepared to represent all constituents including Latinos, and noted that his wife and in-laws are Hispanic origin. The lawsuit has been filed in federal court, and the first hearing is scheduled for December 2. Congresswoman Sheila Jackson Lee and leaders at and supporters of the North Forest Independent School District received good news today: the reported closing of the district is premature. In a teleconference with Robert Scott, Commissioner of the Texas Education Agency, the commissioner said that no final order of closure has been issued for the district. Congresswoman Jackson Lee said this statement gives a new lease on life to NFISD. NFISD Acting Superintendent Edna Forte said the statement from Commissioner Scott lends itself to real hope. During the year, she and the administration will be providing the TEA with information on the measured growth of the district. Forte has already cut the district’s budget and hired a new principal at North Forest High School. That new principal, James Troutman, is encouraged that NFISD has the opportunity to make its case and show what its children can accomplish. Congresswoman Jackson, of the 18th Congressional District, said she was pleased to convene the meeting today with NFISD administrators, board members and local ministers who all have the same goal: to prove the value of the district to its children. She said everyone in the meeting expressed their commitment to the children of North Forest and they emphasized that to Scott. Both Board Chair Albert Coleman and Secretary Lois Edwards thanked Commissioner Scott for his statement today. “This is a real opportunity to show what we can do to improve,” said Coleman. Pastor Theophilus Berry of Greater True Life Church said it was refreshing to hear that no final order of closure has been issued for NFISD. Pastor Willie Jones of New Mt. Calvary Baptist Church was also glad to hear the Commissioner’s statement since many people in North Forest believe the district is being closed. The North Forest Independent School District is a majority minority district in northeast Houston. Before any final action is taken on the issue of closure, the U.S. Departments of Education and Justice will have to review the issue to determine if the community is being adversely affected. Dr. Pedro Noguera, a professor at New York University and an expert in school improvement who is in Houston for meetings with North Forest educators, attended the meeting and the teleconference. He called the news encouraging and said NFISD should take it as a challenge to move its schools in the right direction. 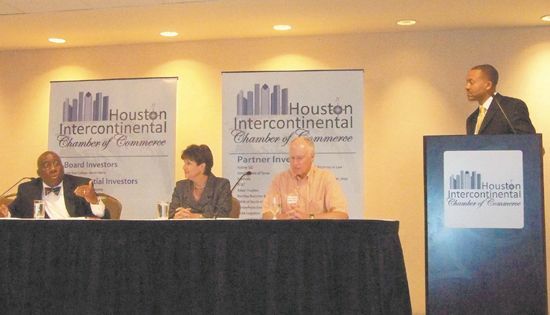 NORTHEAST– The superintendents of three of the school districts in North Houston made presentations to the Houston Intercontinental Chamber at their luncheon last Thursday, August 4th. The subject was the “State of the District” for each. Moderating the panel was Lone Star College’s Dr. Larry Rideaux, and participating in the panel were Klein’s Dr. Jim Cain, Aldine’s Dr. Wanda Bamberg, and Spring’s Dr. Ralph Draper. North Forest’s Edna Forté was also scheduled, but was unable to attend. Chamber members heard similar reports from all three superintendents. Basically, the districts will continue to provide quality education and innovative programs, and have managed to reduce their budgets to match the cuts that came in the recent session of the Texas Legislature. Cain said this was the good news, and decried the fact that the media often preferred to present the negative side of the story more prominently. He said that this was the 3rd year in a row that Klein ISD was a “Recognized” district, indicating a measurement of educational success. In the often mentioned TAKS scores, 14 out of 25 of his group had increases in their scores. Klein will be 46,000 students in the coming school year, with most of this growth in the northern area. 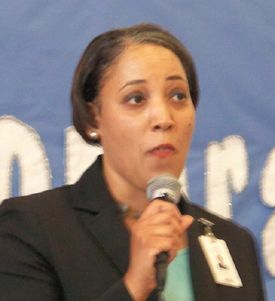 Bamberg said that Aldine saw their job as “educating citizenry” and thought they were accomplishing this well on their 74 campuses, with 63,000 students for the coming school year. She said that the district was preparing for the new STARR tests to replace the TAKS tests. These will reportedly be much more rigorous. In regard to budgets, she indicated state fund cuts could have been worse, and that Aldine has made adjustments to continue a quality education and most but not all of the special programs, such as magnets. This has been accomplished with no layoffs of staff, she said. Aldine will open a new high school in 2012, but does not plan any additional construction for the near future due to the economy. Draper said Spring ISD will open a new campus, with the area’s first “Green” school. It will have a Discovery based curriculum. He indicated that Spring is adjusting to changes in Education, as we become more of a global society. Also, he noted that there are new ways to learn, with emphasis on electronic “gadgets”. He also praised his teachers, who have already returned to work in many cases, he said, even though their pay has not started. He recommended that Chamber members read a book on the state of education, “Catching Up or Leading the Way” which expounds on the idea that the US is more advanced in education than most of the countries of the world. He noted for proof, that 75% of the world’s patents are in the US. Draper also said that tomorrow’s education must have a balanced “portfolio” approach, with many choices, that include Academics, Athletics, and the Arts. The goal would be to allow the development, growth, and expression of themselves by tomorrow’s students. Chamber members presented questions from the floor, to make the luncheon more interactive. Sally Bradford of the Greenspoint Redevelopment Authority asked about the status of Arts Programs in the Districts, expressing some concern that state budget cuts might be felt most in this area. Superintendent Bamberg said that in Aldine, Fine Arts programs had not been cut, but that 5 of 22 magnet programs had been. Dr. Draper said that there were no cuts in classes in Spring, but some staff in the arts had been cut. Dr. Cain said there were no cuts in Fine Arts in Klein. Jack Drake of the Greenspoint District asked where the leadership in Education was coming from in Texas. Cited by the superintendents were leadership conferences, TASB and TASA agencies, and Region IV workshops. Dr. Bamberg, who has been named the Superintendent of the Year in Region IV, stated that the public must help make Education a Priority in the Texas Legislature. 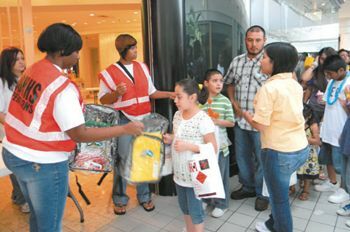 NORTHEAST– Return to school is almost here and various organizations held Back to School events and a Health Expo at Greenspoint Mall on Saturday July 30. Included in the day’s events were health screenings, immunizations, I.D. kits, fun activities and presentations of healthy life styles at some medical and dental booths. Also, aproximately 1,000 free backpacks stuffed with crayons, notebooks and pencils were given out by Community Health Choice and the other sponsors, which included the YMCA, Summit Dental Center and more. The Health Expo also included information and assistance with Food Stamps, CHIP and Medicaid. Some of the local organiztaions present were Bonding Against Adversity, Grandparents Raising Grandchildren and Mission Greenspoint.